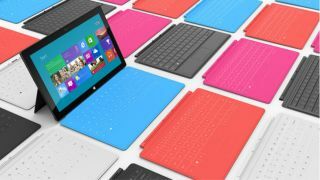 Microsoft has unveiled Windows 8 To Go, a USB stick that will allow users to run Windows 8 on a Windows 7 PC. It's basically a 32GB USB drive which runs Windows 8 on any PC you plug it into from Windows XP upwards. As well as storing the OS, the USB will save users' apps and settings so that any PC the To Go stick is plugged into will seem like your home Windows 8 computer. Of course, Microsoft's pitching it at business users; if you're a workaholic, you can access all your work data and settings from home, or holiday, or the motel you have to move into while the divorce goes through. The USB drive was shown off at Microsoft's Digital Worldwide Partner Conference this week with no word yet on pricing and availability. No doubt Windows To Go will be available from approximately the same time as full-blown Windows 8, which now has an official release date of 'late October'.